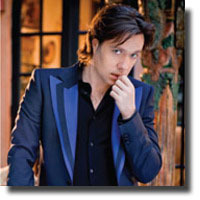 Rufus Wainwright has a long pedigree in Canadian popular music. The son of Kate McGarrigle and Loudon Wainwright III and older brother to jazz/folk singer Martha Wainwright, he was born in New York State, but grew up mostly in Montreal. Wainwright stepped onto the Orpheum stage that normally accommodates about thirty musicians. Attired in a dark blue glitter suit and a matching loosely hanging scarf that made him look the rock star that many of his fans reckon him to be. Without venturing far from his flamboyant troubadour style, he alternated self-accompaniment on piano and guitar, serving up a repertoire of old favourites and what he hopes will be new favourites. Wainwright’s songs range from melancholy to depressing, occasionally bordering on dreary, but in live performance he shows a deftness to surprise his audience by adding a whimsical dimension to his witty songs. He kicked off the concert with The Art Teacher and This Love Affair a couple of tunes from his 2004 Want Two album. Next, for what he explained is a so far unreleased song Chic and Pointless, he stepped away from the piano and picked up the guitar. Unlike his dexterity on the piano, Wainwright barely seems to know more than a few chord changes. On songs like California his guitar accompaniment consisted of basic strumming, relying on his unique vocals to carry the tune. Wainwright doesn’t appear to care too much about introducing his older songs. He no doubt sensed that they were already familiar the many hard-core fans in the audience– and who cares about song titles anyway. He did, however, take a little extra time to introduce Out of the Game and Jericho, a pair of (relatively) up-tempo songs from his latest album. The singer completed a ninety-minute, non-stop performance with Cigarettes and Chocolate Milk and the dramatically textured Going to a Town - a song that most ardent followers might consider to be “I'm so tired of you, America.” Wainwright doesn’t discuss the meaning of his often obtuse lyrics, leaving it to the listener to find their own interpretation. When Wainwright left the stage to a standing ovation, hardly anyone moved towards the exits. You just knew that there would be an encore and he didn’t keep his audience hanging too long before returning for a generous encore that included a lustrous rendition of Hallelujah, a concert classic composed by his fellow Montréaler Leonard Cohen.